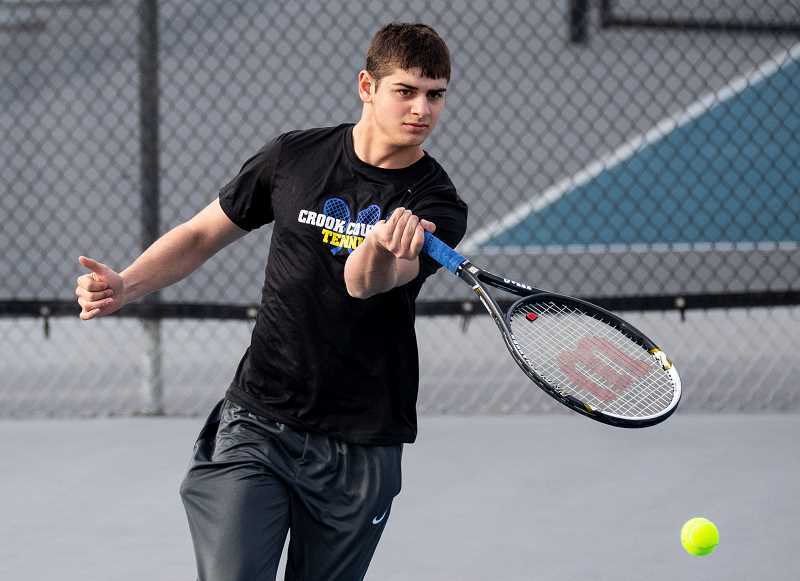 The weather has had a huge impact on Central Oregon tennis so far this year. Teams missed at least two weeks of outdoor practice with snow on the courts, then missed even more time with spring rains. The Crook County Cowboys have already had multiple dual meets canceled or postponed, and that happened again this week. The Cowboys were scheduled to host Mountain View on Tuesday. Instead, the dual was moved to Wednesday as rain made the courts unplayable Tuesday afternoon. In the rescheduled match Wednesday afternoon, the Cowboys struggled to win sets, as the team fell 6-2 to the Cougars. Oelkers has said all season that the team's strength, at least early in the year, will be in singles play. Wednesday's action seemed to back that up as the Cowboys won two of the four singles matches contested, but were blanked in singles play. Foreign exchange student Pablo Casado remained undefeated on the season, taking a 6-1, 6-0 win over Mountain View's Cam Ahern in No. 1 singles action. Casado struggled early with his serving, double faulting twice in the first game that he served in, as Ahern tied the match at 1-1 early in the first set. However, after the slow start, Casado was dominant, controlling the remainder of the match with sharp ground strokes and great passing shots. The Cowboys' other win came at No. 4 singles, where Garrett Bond rolled past Ty Schiffman 6-2, 6-4. In No. 2 singles, Mountain View's Desmond Fierrot took control early in the first set, whipping Moses Freauff 6-2. However, Freauff appeared to rebound in the second set, taking a 3-0 lead before Fierrot regained control of the match, blanking Freauff the rest of the way as he came back to win the second set 6-3. In the final singles match, Mountain View's Grant Burk defeated Crook County's Jordan Owens 6-3, 6-2. In doubles action, Mountain View was able to dominate both the No. 1 and No. 2 matches, while the Cowboys were forced to forfeit the remaining two matches. In No. 1 doubles play, T.J. Fournier and Chas Fournier broke open a tight early match to defeat Jeremy McCullough and Yuya Yamaguchi 6-4, 6-0. McCullough and Yamaguchi trailed just 5-4 late in the first set but were unable to win another game in either set as the Fournier brothers took control. Then Kade Ahern and Holden Karish rolled past Nick Cushman and Ty Cross 6-0, 6-3 in No. 2 doubles play. Cushman and Cross played better as the match progressed but were unable to break through as the Mountain View doubles team played just well enough to hold on for the win. The Cowboys were scheduled to open their league dual meet schedule on Thursday. However, rain Wednesday night and early in the day Thursday made it unlikely that the match was played as scheduled. Weather permitting, the Cowboys return to the courts on Saturday for the Madras Invitational Tournament. The Intermountain Conference schedule continues next week with the Cowboys traveling to Redmond on Tuesday, then hosting The Dalles on Thursday. Both matches are scheduled for 4 p.m.